Arial Chen helped support an energy-focused design charrette for REI’s new retail stores. REI, the world’s largest outdoor co-op, its employees and its members are passionate about protecting the health of the outdoors. Having previously hired EDF Climate Corps fellows, REI has made great strides in numerous energy efficiency measures. Looking to go further, the company hired EDF Climate Corps fellow Arial Chen to work with internal and external stakeholders to build a perspective on what sustainability in the next generation of REI retail stores could look like. 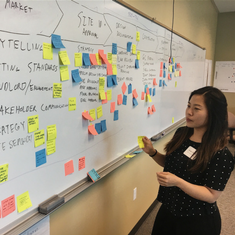 Chen organized the three-day REI Retail Sustainability Charrette, which consisted of 15 REI employees and a number of other organizations, to examine opportunities for sustainability in the new store opening process. At the end of the charrette, attendees developed a list of 11 new store design priorities and 95 individual amendments to the new store delivery process. Based on these suggestions, Chen worked with internal teams to draft new store prototype specifications, a performance enhancement checklist for lease negotiations and lease form revisions to reflect new sustainability commitments. Chen suggested seeking out opportunities to leverage existing relationships (with landlords, vendors, other tenants, members and etc.) to drive sustainability projects and brand value. With Chen’s recommendations, REI is better positioned to look beyond traditional retail uses and spaces and optimize the performance of its new stores. Arial Chen is currently at the University of Southern California working towards a Master of Building Science and Graduate Certificate in Sustainability and Business. She is passionate about developing the business case for sustainability in the built environment. She currently works for her universityâ€™s sustainability office.